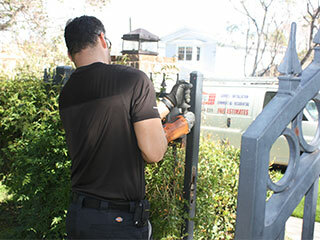 Gate Repair Services You Can Count On In Encinitas, CA! Automatic gate systems are designed to make your life easier and more convenient. Should they malfunction or fail to function completely, they can have the opposite effect, adding stress to your day to day life. Don’t suffer in silence contact our local team of gate repair experts today! A drooping gate will most likely require professional attention. Significant sagging is commonly due to bad welding in the case of steel gates, or rot and improper support with wooden gates. There are two possible remedies for a sagging gate. The first is to reinforce the support structures with posts and struts. The second option is to make small, precise adjustments to the gate to realign it. By their nature, swing gates place a heavy amount of stress on their hinges. Over time, they may give out, or the post itself could give way. If you experience either, or both of these issues, contact our local team of professionals. Our expert technicians will carry out the necessary gate repairs to get you back in A-1 working order. Automatic gates offer both security and convenience. The latter can be enhanced with the use of a remote control opener. These openers, although durable, are still susceptible to wear and tear. If one or more of the opener’s moving parts malfunction, your entire system could fail to function. Fear not! One of our friendly technicians will come to the rescue. Electric Gate Repair Experts Near You! As with most systems, convenience is achieved with automation. In terms of your driveway gate, this is provided by an opener unit and its sensors. Should either of these components fail, you’ll have to manually operate your gate, which of course defeats the object of having an automatic entry system! Call our skilled team immediately, and we'll get your system running smoothly again. No matter what issue you’re facing, our expert team at Gate Repair Encinitas has the skills, materials, and experience for the job. Make an appointment today!